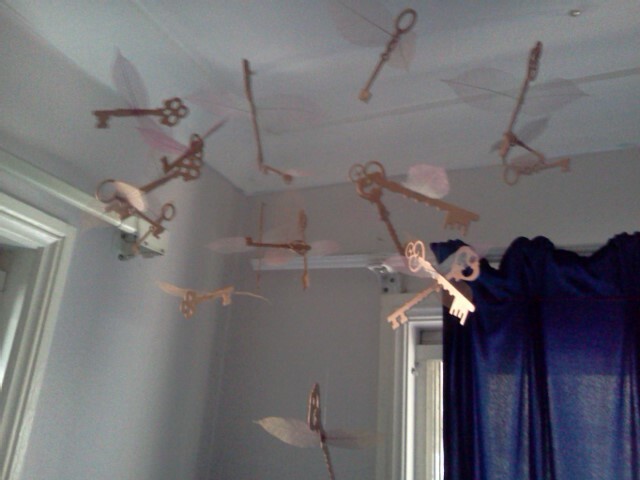 Flying keys and floating candles. I got some Kaiser craft Wood Flourish keys from this wonderful site, 1/2 the price of anywhere else. I bought some copper spray and gave them a spray, used skeleton leaves which I glued on for the wings with hot glue ( Yes Kathy I used hot glue )(LOL), Vicki then sewed them onto some white netting and hung that from her lounge room ceiling, they looked so good. The skeleton leaves I used for wings. Little clear containers I used to hold the wings while the glue dried. I bought some battery operated votive candles from the Reject shop and then cut A4 printer paper in 1/2 and used double sided tape to stick it on and used invisible thread to hang them. 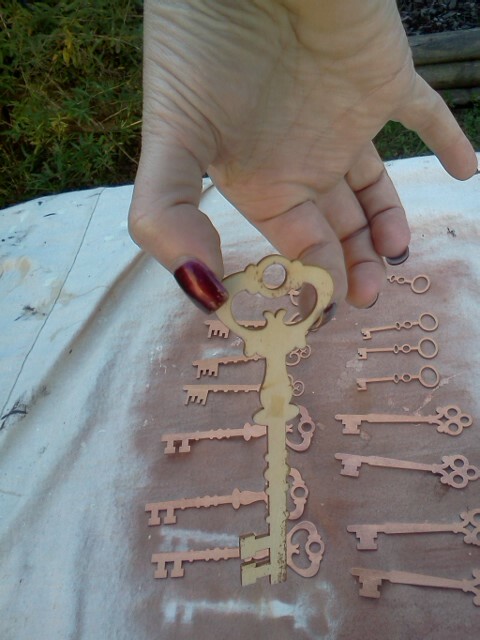 Vicki did the same thing as she did with the keys and sewed them to some white netting and hung them up. A light breeze was blowing so it looked like they were floating.